While Dicerca pugionata (family Buprestidae) is, for me, the most exciting beetle species that I’ve found in Missouri associated with ninebark (Physocarpus opulifolius). it is not the only one. The beetles in these photographs represent Calligrapha spiraeae, the ninebark leaf beetle (family Chrysomelidae). Unlike D. pugionata, however, I almost never fail to find C. spiraeae on ninebark, no matter when or where I look, and whereas D. pugionata has been recorded in the literature associated with a few other host plants like alder (Alnus spp.) and witch-hazel (Hamamelis virginiana), C. spiraeae is not known to utilize any other plant besides ninebark as its host. Beetles in the genus Calligrapha are among the most host-specific of all phytophagous beetles, with most of the 38 species in this largely northeastern North American genus relying upon a single plant genus as hosts (Gómez-Zurita 2005). The genus as a whole is fairly recognizable by its dome-like shape and black and white or red coloration, with the black markings on the elytra varying from coalesced to completely broken into small spots. The species, however, are another matter, with several groups of species that are quite difficult to distinguish morphologically. Fortunately most of them can be easily distinguished by their host plant (although such information is rarely recorded on labels attached to museum specimens). Calligrapha spiraeae, for example, with its reddish coloration and small black spots, looks very much like two other species in the genus—C. rhoda and C. rowena. Those latter species, however, are restricted to hazel (Corylus spp.) and dogwood (Cornus spp. ); as long as the host is known, the species can be readily identified in the field. At this point you may be wondering why the species name refers to the plant genus Spiraea rather than Physocarpus. In fact, ninebark was already known as the host plant when Say (1826) described the species, but the name spiraeae was given because at the time ninebark was included in the genus Spiraea (Wheeler & Hoebeke 1979). Wheeler, A. G., & E. R. Hoebeke. 1979. Biology and seasonal history of Calligrapha spiraeae (Say) (Coleoptera: Chrysomelidae), with descriptions of the immature stages. The Coleopterists Bulletin 33:257–267. 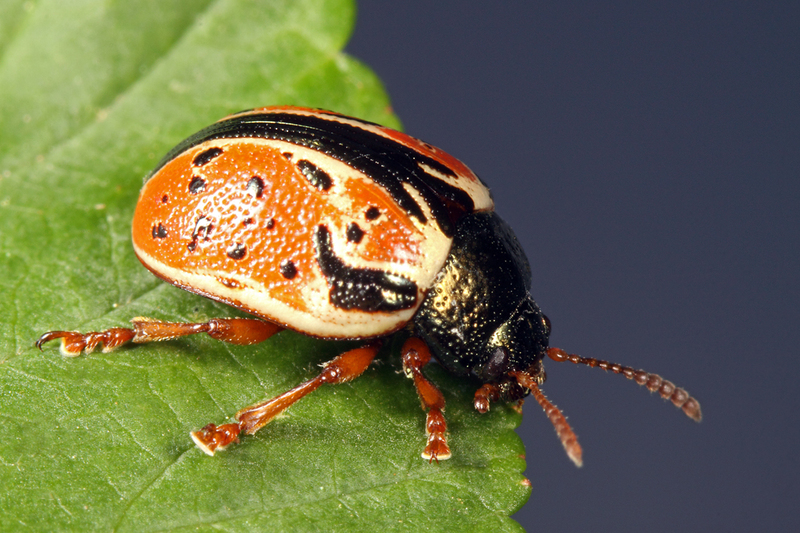 This entry was posted in Chrysomelidae, Coleoptera and tagged beetles, entomology, insects, leaf beetles, Missouri, nature, science. Bookmark the permalink. Calligrapha always brings back memories for me. My first real research job as an undergraduate involved a Calligrapha specialized on willows and what happened to their relationship in a willow hybrid zone. Oh, and, lovely photos, Ted! I knew you must have had some beetles roots in you somewhere! I wonder how much morphological variation there is in the larva. You would think each plant species “environment” presents different challenges to force variability. Wheeler & Hoebeke distinguished the larva from other species only by features of coloration of the head and other sclerotized segments. I can imagine much of the larval morphology is highly conserved/reduced, considering it is essentially a membranous feeding bag! Those larva could compete well in the “cute” contest, imo. I went and had a look since I did not have a clue…. I’ll have to look for these on the ninebarks I’ve planted as part of my backyard native hedgerow. Factoid: An old synonym for Queen of the prairie, Filipendula rubra is “Spirea herbacea”. Generic concept were broadeer in the old days, eh? The species does get on ornamental plantings of ninebark. Of course, in such situations it is called a ‘pest’ but I have never seen it cause significant defoliation and would instead welcome it in the garden as additional native biodiversity. 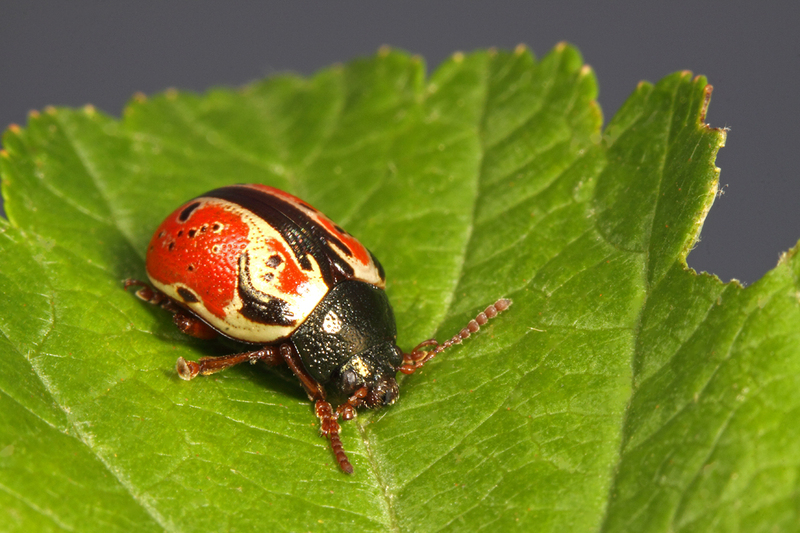 I’ve got Chrysomela on my Spiraea! I’ve been looking for them every day since you posted this, but so far, the only herbivory I’m detecting is from the blankety-blank deer! Nice beetle!. I photographed Calligrapha verrucosa at Dinosaur Provincial Park a couple of weeks ago. They’re willow feeders, although I found mine hoofing-it across the sand while I was in search of tiger’s. I’ve planted a lot of Nine-barks, but no sign of the beetle yet. I’d rather have it than the usual aphid plague. Nothing on the Red Osier Dogwood either, or on the Beaked Hazel Nut in the bush – although it is plagued by lace bugs. Perhaps those Chrysomela species don’t get this far to the NW. However, we do had Chrysomela mainensis on the willow and a Chrysomela cf knabi that wandered through. I guess they will have to do. I suspect you’re too far out of range for the beetles, whose distributions tend to match rather closely the distributions of their native hosts. Chrysomela aren’t nearly as cool as Calligrapha, but they’ll do in a pinch! I found a beetle. It appears to be in your collection on the bottom to the right. If you care to, please visit and identify. Thanks!